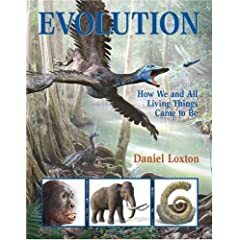 This entry was posted in book review, creationism, Darwin, Dawkins, evolution, intelligent design, religion, Science, Science and Society and tagged Add new tag, Charles Darwin, children, creationism, Daniel Loxton, evolution, kids, religion, skeptic. Bookmark the permalink. It probably would be a very good thing if every evolution book attacked religion in the style of the more feverish atheistic propagandists. Why bury it in chapter 10? Start with a catchy subtitle and then go right up front in the Intro and first chapter. Once that’s out of the way, the interpretation of fossils can begin. Perhaps it would have been better to leave this out – but on the other hand it is a common question which kids will have to confront. It’s normally given a free pass in society and this is wrong. It’s unhealthy for people to believe in invisible magic sky daddies. I agree, Cedric. But a clear comment on religion probably would have prevented the book getting into many schools. That said, I think Loxtons brief comment could have been less accomadationist, more science.